In this fascinating article recently published in Narrative, author and editor Tom Jenks recalls being a young staffer at Scribner's in the 1980s and being given the task of editing for publication Ernest Hemingway's unfinished novel, The Garden of Eden. "[Charles Scribner, Jr.] gave me two paper grocery sacks filled with manuscripts and enjoined me to read them. That night I schlepped The Garden of Eden home on the subway. Later I got into bed and started reading, determined to put the task behind me. But by morning I was convinced that the mass of material held a story worth publishing. The work was wildly uneven, and much of it was embarrassingly weak, though portions had sustained strength and suggested a new sort of Hemingway, one whom E. L. Doctorow would characterize in his review of the book as reaching for a fuller, more thoughtful, emotional range with a hint of feminine understanding." 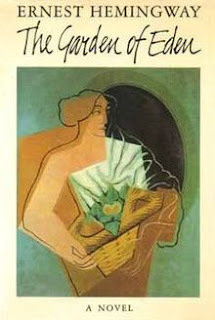 John Updike's review of The Garden of Eden. The New Yorker, June 30, 1986. "Garden of Eden Screenwriter on Adapting Hemingway’s Steamiest Novel". Vanity Fair, December 10, 2010. The Committee Room proudly presents Gene Twaronite's "The Woman Who Came for Lunch" as the TCR Story of the Month for January. This brief and witty story examines aging and illness and raises profound questions about identity itself. Gene Twaronite is an Arizona based writer of fiction for both adults and young adults. He is the author of the young adult novels The Family That Wasn't (2010) and its sequel My Vacation in Hell (2012). His stories have appeared in The Write Room, Read Magazine, Highlights for Children, and the anthologies The Mix Tape (Fast Forward Press, 2010) and In Short: How to Teach the Young Adult Short Story (Heinemann, 2005). Gene is also the author of two collections of essays -- Letter to a Mountain (1977) and Nature's School (1985). "The Woman Who Came for Lunch" was originally published in Avatar Review (No. 13, Summer 2011). To read "The Woman Who Came for Lunch" click here. A: I started keeping a journal just after college (1970)—a habit that I have tried cultivating since then with only infrequent periods of success. Q:What gave you the idea for "The Woman Who Came for Lunch?" A: The idea was inspired by my late mother, who at the time of her death at age ninety was diagnosed with dementia. As I witnessed her gradual decline and submergence into a world of diminished cognition, I became obsessed with the question of what happens to that person I knew and loved—where did she go? Does she still live out her dreams in some hidden fantasy world known only to her? Does she still have adventures based on her long term memories? And as I watched my dad struggle to care for her at home, I idly wondered what might happen if a husband and wife both suffered from dementia and no one else knew. That is essentially the setup for the story. While the premise is a bit absurd—that such a couple could go on living together at home undetected by others—I was attracted by the “what if?” aspect of the story. Mainly I just put the two characters on a stage and let their dialogue unfold and tell the story, while weaving in little details from my own life (like the panic I once briefly experienced upon getting momentarily turned around in a familiar neighborhood) as well as things I remember about my mother (such as her habit of hiding away things in ever smaller nesting boxes). Q: You write for young readers (middle grades) as well as for adults. What are some of the things you keep in mind when writing for kids? A: The most important thing is not to “write down” to them or to preach to them. I always try to write for the kid inside me, whether that kid is ten or as in my case going on sixty-four, and I think that helps keep me from writing something phony. And I try to put a little absurdity into most of my stories, for kids just love the absurd. And so do adults for that matter, at least those who have not lost touch with their inner kid. As the late Shel Silverstein wrote in one of his poems, “Put something silly in the world/Thatain’t been there before.” That’s great advice for any writer. We tend to take ourselves too seriously. There is nothing that will turn me off faster to a story than a complete lack of humor in the writer. And whether writing for younger or older readers, whether the words or plots are simple or complex, the story’s the thing. Tell a good story and it really doesn’t matter what age group you’re writing for. Q: Who are some of your favorite "classic" writers? A: The writers to whom I am most indebted as a source of both writing inspiration and reading joy include (not necessarily in order) Mark Twain, Kurt Vonnegut, Ray Bradbury, Carl Sagan, Albert Camus, Eugene Ionesco, Henry David Thoreau, Franz Kafka, James Thurber, E.B. White, Roald Dahl, Eleanor Cameron, Will Cuppy, Woody Allen, Edward Abbey, H.P. Lovecraft and J.R.R. Tolkien. I could go on, but I think this gives you a pretty idea of where I’m coming from. Q: Who are some of your favorite contemporary writers? A: One of my favorite authors is Magnus Mills, who writes these funny little novels filled with magic and mayhem. I have read his Three to See the King three times now and it gets better with each reading. His The Scheme for Full Employment is also an absurd treat that offers poignant insights into the human condition. I just finished reading the novel Martin Dressler: The Tale of an American Dreamer by Steven Millhauser and was blown away by how the author recreated the streets of early New York and the big dreams of its inhabitants. Millhauser's short story collection The Knife Thrower and Other Stories is one of my favorite anthologies. His edgy title story takes you to the brink of suspense—will he do it? And in his story “The Visit,” he proves himself as skilled an absurdist as Kafka. I also enjoy the short stories of Rick Bass, especially those in his anthology The Lives of Rocks.